Rate this Article Some games may not seem incredibly appealing when they first came out. However, through time and constant improvement, a part of these games do actually get better. In this article, we detailed the journey of HonorBound from what it had been to what it is today. HonorBound has been an amazing game over these years. It was released back in 2013 and I have enjoyed it since then. It has a lot of traditional RPG elements in it; wherein, you take turns battling against various monsters and move forward towards your quest to restore balance to the world. There are tons of monsters and new units that you can encounter and there have also been various changes over the years. It was originally released for the Android and iOS, the battle system and the exploration system was perfect for these devices. Unlike old RPG’s wherein you would always explore around the map and go around looking for new loot and enemies, HonorBound made it simple. Touch controls was just perfect as you would only need to tap arrows to move towards a certain direction. 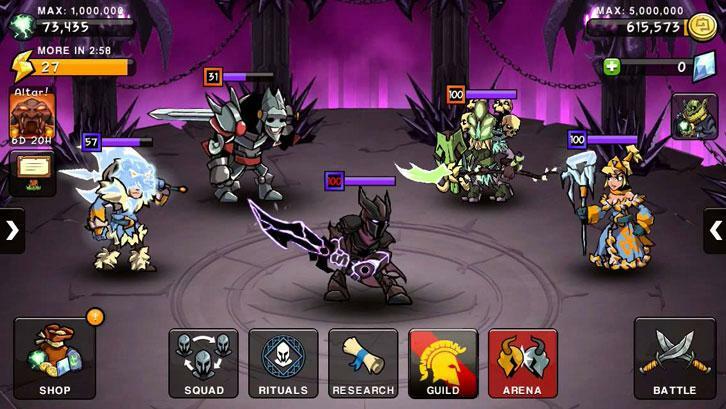 The battle system was also easy as you can tap on your units to select them and tap on the enemies to attack them and as well as tapping on skills to use them, it was simple and well executed. Over the years, it has made its port to Facebook and as well as a Facebook integration which helped in synching your progress between devices and as well as to connect the game with your friends. But a few years back, some changes has made the game laggy and had made it a bit unplayable on certain devices. But lately, I have noticed that they had made the game more lightweight and a few tweaks to make it run smoother. The games core mechanics remain intact but lately there have been more in app purchases which some may like and some may not. But from time to time, they do give amazing offers and Epic units that you just couldn’t resist. Most may be bought by purchasing crystals using real money but when I started playing, I felt lucky as I had tons of bonus crystals when I signed up and as well as a bonus Legendary unit to add to my roster. There are really a lot of great limited time offers that come to this game from time to time, so you better keep an eye on that. The amazing units that I received actually helped me steam roll to higher levels with my first account. The game also had additional VIP levels added which would unlock additional locations to explore and as well as new quests and events to participate in. If you are really hooked into the game, getting a VIP status might be worth it. The addition of PVP and Guild also has added various new rewards and other perks into the game. And the Guilds would really get you more of an immersive feel to the game and as well as a great sense of community. It really feels great to interact with people who love the same game as you and they can also give more tips to progress further into the game. The game does come with an extensive and lengthy story to compliment the amazing battle system that it has. Players will be getting lost in their quest as they unravel more mysteries. It truly is an immersive experience. I can say that they game and its community is really alive as this game has survived over the years and updates truly add more depth to it. If you haven’t gotten into it yet, you can give it a try.